I have the background set. What kind of solution are you looking for? 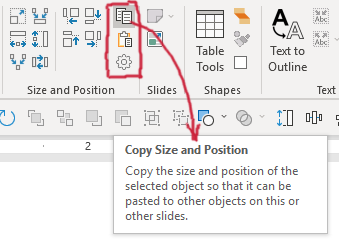 If #1, you can use the Format tab to manually set the size the same and then use the Format Painter (in the Home tab, Clipboard group) to copy/paste the formatting from the source shape to one or more target shapes (double-click the painter button to use in multi-mode).To set the position the same, your best option will be to use custom Guides (right click on a slide to add guides). 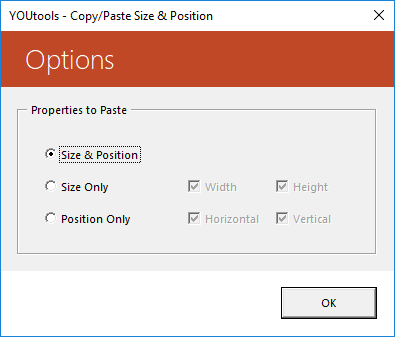 For #2, the company I work for has an add-in called YOUtools that allows a user to copy the size and position properties of an object and then selectively paste one or more of those properties to other objects on the same/different slide(s). For #3, I await your response. 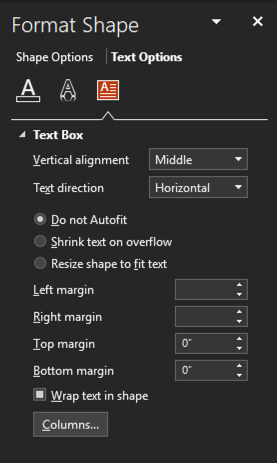 Just wanted to add a bit of info to #1: you may need to change resize shape to fit text into do not autofit in order to get the textbox heights the same. Otherwise they'll adjust to fit the amount of text. To do so, right-click the text box, choose Format Shape. Then in the Format pane, click Text Options and then Textbox. You can choose Do Not Autofit there.